It's always great when a plan comes together and the beginning of this year has seen all the frantic and stressful attempts at trying to get some co-ordination around Daisy' care paying off at last. As we near the end of March she has already had two hospital stays involving multi-disciplinary teams and we have started getting some more plans and answers in place as a result. The first stay, which I blogged about here) involved surgery to assess her airway and remove a second set of adenoids. She moved onto the neurology ward, via the urodynamics day ward and spent 3 days hooked up to a telemetry machine. 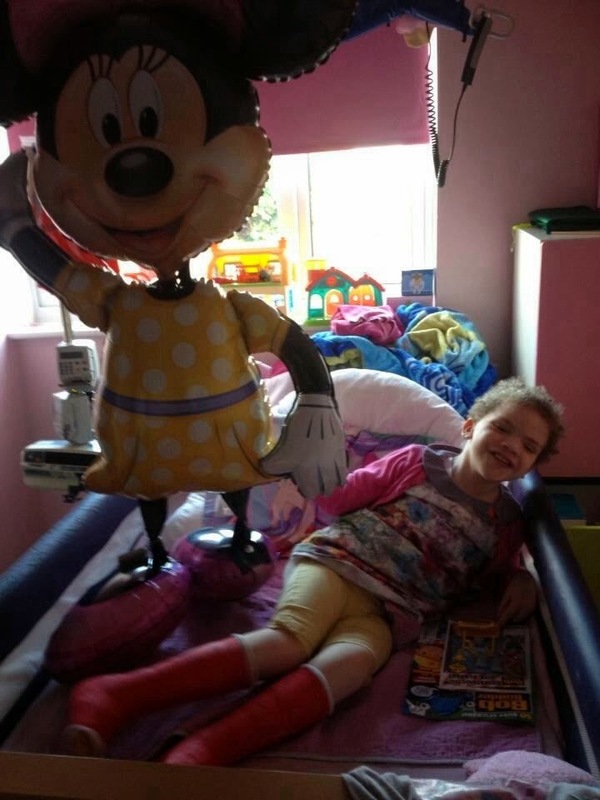 Daisy was amazing - not only had she started the week having to endure another anaesthetic and surgery, she then had to have some very painful tests on her bladder, closely followed by having EEG electrodes glued and taped to her head. Our biggest fear was that she would go through all of this and it would tell us nothing. Well the surgery and investigations on her airway showed that there was a little bit of scarring in her airway but nothing to worry unduly about which was a relief, the urodynamics tests, which were sub optimal because of Daisy's non-compliance still showed a very overactive bladder which gives us some more answers as to why she has so much pain. Our biggest worry was that she would endure 3 days of telemetry testing and not have a seizure, crazy that having spent most of our time hoping she doesn't have a seizure, we then switched to hoping she would have one so that the telemetry monitor would record it. Well Daisy did us proud and displayed 4 seizures during the time giving the team lots of evidence to interpret. The analysis of the telemetry results confirms the initial findings that the seizures are definitely multi-focal - they are firing from both sides of her brain and causing the tonic-clonic seizures. Her official label is Multi-focal epilepsy. It's the most difficult to gain good control of we are told. We have now moved our expectations from achieving total seizure control to just having less seizures. We are slowly edging our way there but knowing epilepsy as we do it has a nasty habit of lulling you into false sense of security then coming back all guns blazing. On the whole, with a combination of two medications, we have seen a reduction in seizures and particularly their intensity and duration - this will probably be the best we can achieve. After our first admission the next step in our plans coming together was a trip up North to visit a Urology Surgeon at Manchester Children's Hospital for a second opinion on what to do next with Daisy's bladder issues. She experiences excruciating bladder spasms that are not controlled by any of the pain meds we have tried, she also has permanent bugs in her bladder which put her central line - her life line, at risk - her central line (hickman line), is a central venous catheter tunnelled into a main vein which sits just outside her heart and through which we administer all her nutrition and the majority of her drugs, without this line she dies, and an infection can cause life threatening sepsis which can mean the line has to be removed, or she will die. 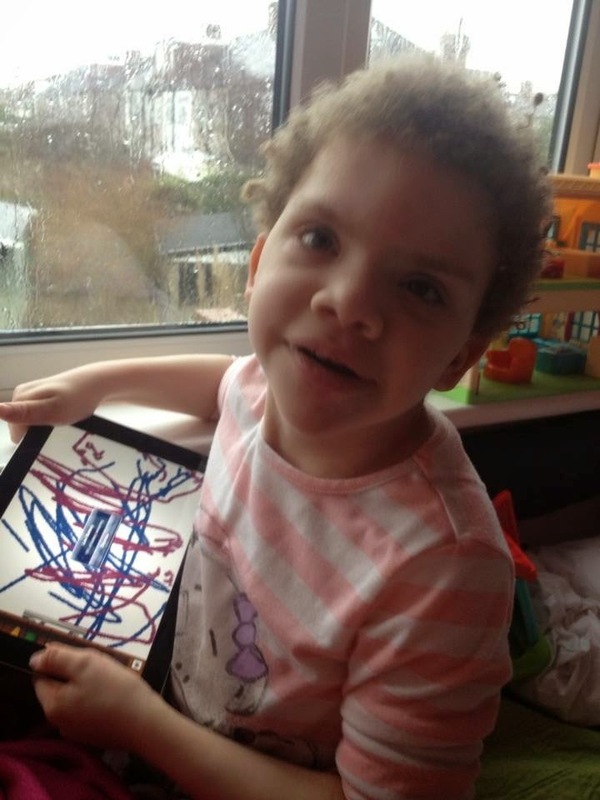 Daisy's Urology Surgeon wanted to consult another Urology Specialist for advice before attempting any more surgery as there are no easy options to consider for next steps. We are lucky that there is a great train service between London and Manchester, even better when we arrived at the station the train manager upgraded Daisy to the first class carriage! She was so excited, it was her first time on an intercity train and of course everyone who met her fell in love with her! Thank You Virgin Trains for ensuring Daisy arrived in style! 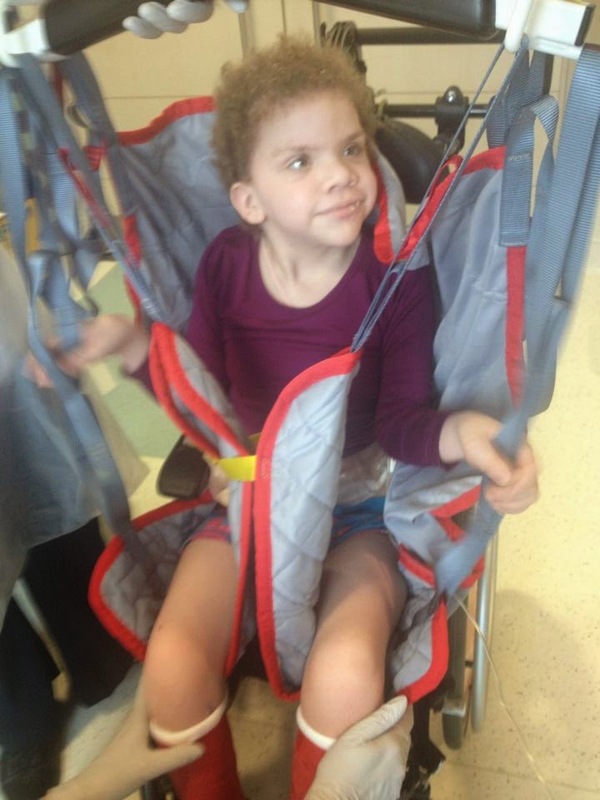 We stayed overnight in Manchester as it was the only way we could juggle IVs and Daisy's care and guarantee that we would be on time for her appointment the next day. It was a very useful meeting and we were really impressed with Manchester Children's Hospital and the Urology Surgeon who was clearly focused on Daisy's overall quality of life, our number one priority for all decision making for her. He suggested in the short term that botox injections into her bladder every six months may provide some temporary relief from the spasms, longer term though the only real solution is a urinary diversion called an ileal conduit - this would involve bypassing her bladder and connecting the two ureters from her kidneys to a stoma on her stomach on the opposite side to her ileostomy - this would mean she would have two stoma bags - one for her ileostomy and one for the ileal conduit stoma or urostomy. It's huge surgery and she may even after that still need her bladder removed but it is the only real option of reducing the risk of the bugs which permanently colonise her bladder and removing the pain she experiences on a daily basis. A few years ago we faced a similar decision when considering whether to remove her large bowel - this was the best thing we did, it certainly removed the pain, it meant she came off the high doses of steroids and immunosuppressants and it stopped the horrific bleeding she was experiencing. Since that time she has become weak and more complex so we have agreed that for now the plan is to try the botox to manage her symptoms short term and to see where we are in 12 months and make a decision about the surgery at that time. It does feel good to have a plan at long last and while we have agreed that the botox (which requires a general anaesthetic) should be done at Great Ormond Street, any further urology surgery will be done in Manchester as we felt that they had a lot of experience of dealing with children who have complex neuropathic bladder issues similar to Daisy. 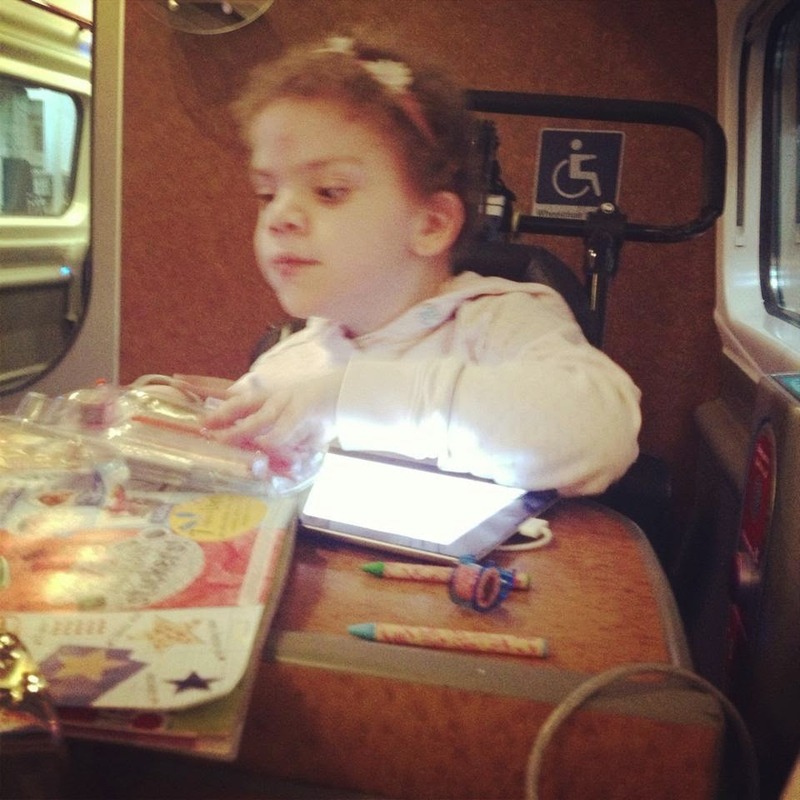 We were grateful again to the staff at Virgin trains on our return trip as they changed our tickets for free as we had to administer midazolam, the rescue medication we use when Daisy is having clusters of seizures or prolonged seizures - she had 8 long seizures during the day and we could not risk hanging around in the station as we needed to get her home quickly, thank goodness for station and train staff who saw sense and helped us achieve that. It brought home to us however how fragile Daisy is, despite all appearances to the contrary, she just did not have the stamina to cope with the 24 hour stay in Manchester and the long outpatients visit and this triggered lots of seizures. 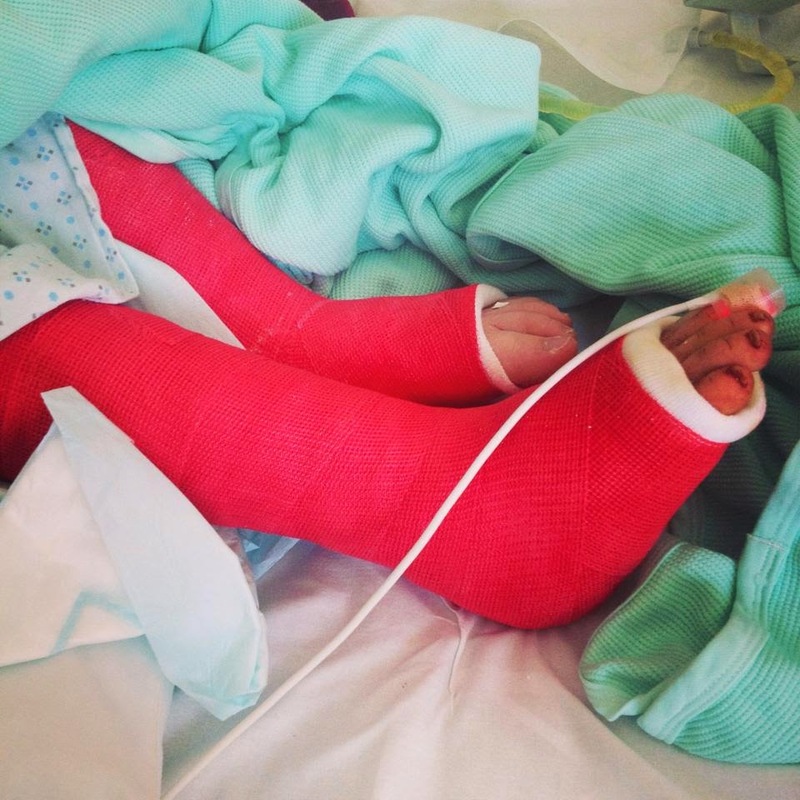 A couple of weeks ago Daisy had another hospital admission, this time for orthopaedic surgery. She had Achilles tendon lengthening surgery just under three years ago but unfortunately, because her health has deteriorated so much during this time they have tightened up again and to keep a level of mobility they needed to be lengthened, this time needing a slightly trickier procedure and a spinal block post surgery and then put into below the knee casts for 6 weeks - red casts, not pink any more as Princess Daisy says she is not a baby! We had hoped that she could also have an impedance study to try and assess her worsening reflux but unfortunately she pulled the probe out in recovery so this can wait for a while. While an inpatient we also caught up with Daisy's Palliative consultant to make some tweaks to her pain management protocol, her TPN consultant to discuss tweaks to her fluid regimen and her endocrinolgist where we also agreed to restarting her daily growth hormone injections. So in all we have had a couple of intense but productive inpatient stays already this year, more meds added into the mix, some answers, some plans. We have however learned to expect the unexpected as far as Daisy is concerned and while we know that many of her non-Costello Syndrome issues are possibly rare manifestations of the disease that has never been seen before there are always the "typical" Costello Syndrome things that we have to deal with, like the orthopaedic issues and as we experienced this week, cardiac issues. Daisy has always had a mild form of cardiomyopathy, thickening of the heart muscle, not uncommon in her syndrome, enough for it to be monitored annually but not so severe that it has needed anything more than careful watching - until this week. We had her annual cardiology review and to my untrained eye the results of the echocardiogram were obvious before the consultant even sat down. There have been significant changes in Daisy's heart in the past year, the thickening in the heart muscle is a lot bigger and affecting her heart. Her resting heart rate is high as it has to work harder and her blood pressure is high. She is at risk of arrhythmia's, uneven heart beats, and these could be fatal. We left that appointment clutching a prescription for beta blockers, with Daisy wearing a heart monitor to capture a 24 hour reading of her heart rate and appointment for clinic in the summer. Heart issues are a Costello thing, a worsening of heart issues after years of them being mild and untreated are not really commonplace in this rare syndrome so again we feel like we are entering uncharted territory as we wait for the results of the 24 hour tape and hope that we are not faced with the prospect of making a decision about whether Daisy should have in implanted cardiac defibrillator.